Although I don’t like the weekend to end any more than the next employed person, I look forward to Mondays now. Tom takes Dora to Lacrosse practice, and Jewel and I hang out and act silly and cook dinner in our easily distracted way. This past Monday we did well getting dinner on the table at all, because we got off on a tangent about maps and spread topo maps of northeast Alabama all over the floor of Tom’s study. But I had promised Dora homemade chicken nuggets, so we had to get to work. Chicken nuggets are not comfort food for me. McDonald’s didn’t come out with chicken nuggets until I was old enough to prefer food with a texture other than “partially digested”, so I never acquired a taste for them. I didn’t realize that adults ate them until places like Tenders started cropping up. Huh. I have had decent handmade chicken tenders before though, so I knew it was possible for them to still taste like chicken. I had my eye on a recipe for parsley root fries for awhile, and I was excited to find parsley roots at Publix. Jewel and I got in a hurry with this meal and therefore forgot to take many pictures while we were cooking. 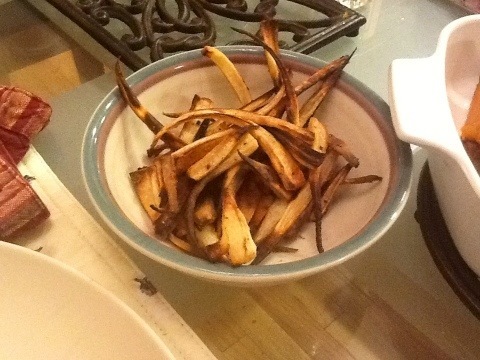 Our first step was to make the Parsley Root Fries. My parsley roots were much smaller and scrawnier than the ones pictured in the recipe. Pre-heat the oven to 375. 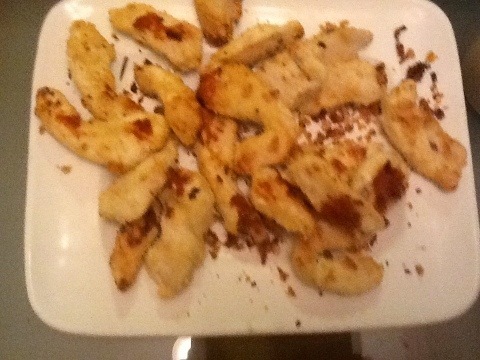 Cut the chicken breasts into tenders of desired size. Place mayo in a small bowl. Mix almond meal, coconut flour, seasoning, salt and pepper in a pie pan. Spray baking sheet with oil or grease with coconut oil. I found a spray coconut oil at Earth Fare so I used that. 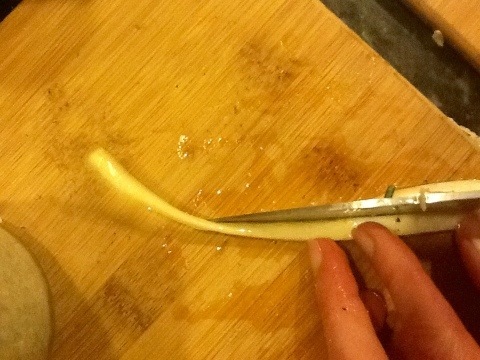 Dip tenders in the mayo to lightly coat, then dip in the dry mixture, place on baking sheet. I’m sorry I have no pictures, but it is the same process Dora uses for her fish sticks. Bake for 30 minutes, turning once. Dora was thrilled when she came home from practice to smell chicken tenders in the oven. She asked if we had any honey mustard, something I hadn’t even thought of. Jewel suggested that we make our own honey mustard, so I had her search for Paleo honey mustard, and she came up with this recipe. 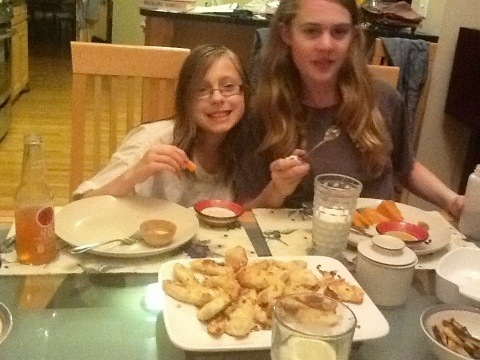 This meal was a huge hit with everyone. I wanted to capture the girls eating their meal, so Dora grabbed a carrot and Jewel grabbed her spoon. 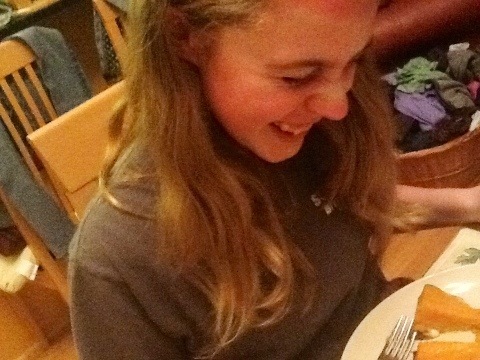 This is Jewel dissolving into one of her classic fits of laughter when she realized she had posed holding the tiny spoon. This was my meal after I already ate some of it. 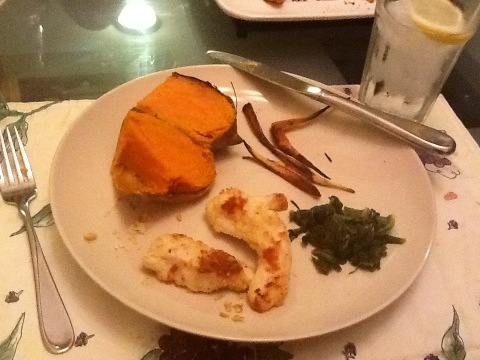 We also had leftover sweet potatoes and mustard greens. The potatoes were especially good because we baked them longer than usual. The parsley root fries were slightly sweet and completely delicious. Next time I’ll try using parsnips, which are more widely available and cheaper. The chicken tenders were not quite as crisp as I would have liked. I started them out at 350 as the original recipe recommended, but next time I’ll start out on 375. I also may try putting them on a rack. The flavor was superb. I really tasted the chicken rather than the breading or just salt. 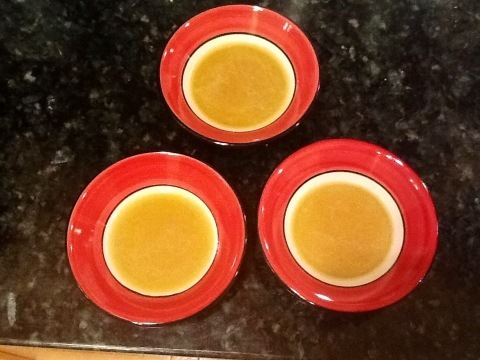 The honey mustard was not as sweet as commercial products, and it had both better flavor and texture. Even Dora commented that most honey mustards have an odd texture. She said that this is the best honey mustard she’s ever had, and she is a huge fan of honey mustard. I usually find it overly sweet, but this sauce was perfect. 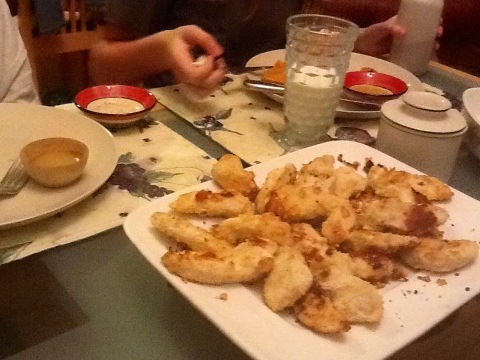 We had the leftover chicken tenders tonight, and Dora specifically asked if we still had some honey mustard left, so it is worth it to take the extra couple minutes to make the sauce. Enjoy!